From Village Hut Mages work their magick in the darndest of places. Some live unassumingly among the masses, but secretly maintain basement laboratories. Others exist and work outside the physical world and beyond human comprehension. No matter where they practice their magick, mages need havens of their own. If you're a mage and you need a home, this is the book for you. 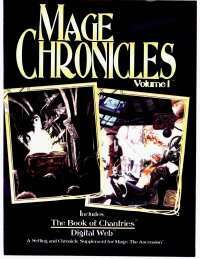 Mage Chronicles Volume 1 features The Book of Chantries and Digital Web, two of the earliest sourcebooks released for Mage that have long been out of print. Now they're back under an all-new cover. Included in this supplement are two of the original Mage supplements - the third and sixth ever released for the game. Vital information for Storytellers and players alike on establishing laboratories, workshops and hideouts - the places a mage needs to master his magick. This is your chance to complete your Mage collection and make a place in the world for your character.